The Jewish community on the British Rock of Gibraltar reached its height in the nineteenth century, when it numbered nearly 2,000, comprising more than ten percent of the general civilian popula- tion. 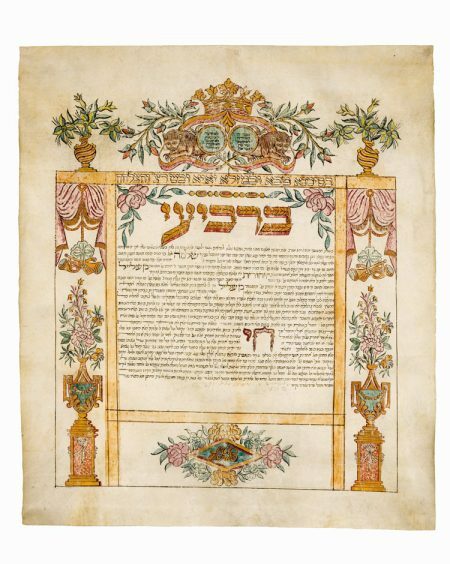 At the time this ketubbah was produced most of Gibraltar’s retail trade was conducted by the local Sephardic community; many of its members came from the adjacent parts of North Africa. Following other Sephardic communities, Gibraltar’s Jews excelled in the art of ketubbah decoration. Contracts were written on large pieces of parchment and ornamented in bright colors. By the second half of the nineteenth century Gibraltar developed its own characteristic and readily identifiable type of decoration. The present Gibraltar contract belongs to an early period of local ketubbah decoration, though some of its features foretell later developments. The upper section depicts a pair of lions crouched back-to-back, overlaid with circles containing the abbreviated Ten Commandments. The composition is reminiscent of the top of Torah arks and indeed it is topped with a crown, intended as a Torah Crown. This motif, typical of later Gibraltar ketubbot, was often modeled on the British royal crown. The crouching lions are flanked by vases of flowers. In the side borders, beneath theatrical drapery and trumpets suspended from ribbons, fanciful column bases are surmounted by urns. Several elements in the marriage contract are charac- teristic of Gibraltar ketubbot. The initial word of the wedding day, Wednesday, as was common, is enlarged and ornamented. The sum of the dowry and increment is a factor of eighteen, the number that is also the propitious word hai, written here in monumental letters amid small cursive script. Also typical of Gibraltar is the ornamental Latin monogram at bottom center. Comprising the letters S J B, it refers to the bridal couple’s first (Solomon, Judith) and last (Benoleil) initials. This feature is also found in Moroccan ketubbot, as are the section with Sephardic conditions, and the request that God take revenge for the expulsion of the Jews from Castile (cat. no. 76).